Accordion Shutters | Willard Shutter Company Inc. 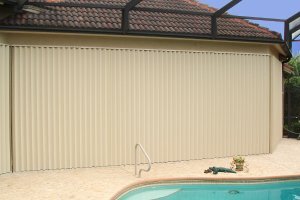 Simple to operate, the Folding Accordion Shutter provides immediate protection from hurricanes, storm, and burglary/ intrusion. It is economical without sacrificing performance. 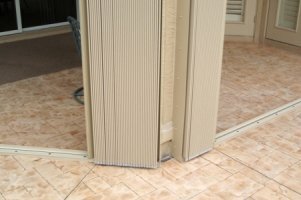 The shutter glides along extruded aluminum tracks using nylon rollers mounted on stainless steel carriages, and can be secured from the inside or outside using aluminum locking rods and an optional key-lock. When open, blades stack neatly like an “accordion” at the sides of the opening. 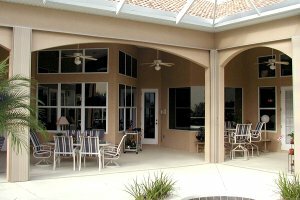 It’s easily adapted to most window and door openings, and widely used to protect large areas like sliding glass doors, balconies, and lanais. The folding design allows for virtually unlimited left to right runs, and gives the product the unique ability to enclose entire areas from a single set of blades. Folding Accordion Shutters are manufactured from heavy-duty aluminum extrusions with .125″ extrusion thicknesses on all structural and supporting members. The system is assembled with 100% non-ferrous fasteners and high quality stainless steel wheel carriages with nylon wheels to oﬀer years of maintenance free service. The extrusion coating is a modified, acrylic/polyester enamel. It is electrostatically applied over pre-treated aluminum and cured at 400°F. To further prevent pitting and corrosion, all mill-coated extruded aluminum shapes pass a “standards” test as recommended by ASTM and AAMA.